Have you been looking for a St. Patty t-shirt perfect for partying? Something funny that will grab attention while you bar hop the night away? FunnyIrishTshirts has the t-shirts for you. One of the funniest says "You look like I could use a drink" It's the refreshingly irreverent kind of humor I like at times. Life shouldn't be taken so seriously and people shouldn't take this shirt seriously either. 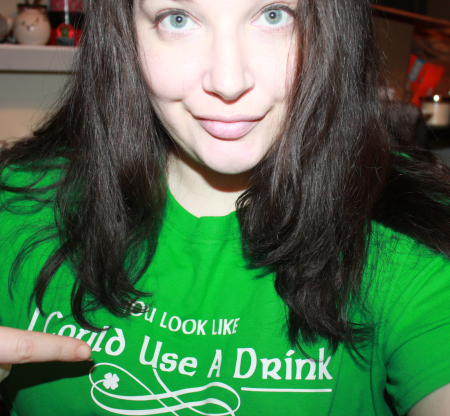 St. Patty's is a day to celebrate and get drunk, if you desire. I don't drink much, but I can relate to this from back when I used to! This t-shirt comes in a size small all the way up to as large as 4x and many other styles for women. You can also choose a different spiffy color. I am wearing the XL in mens and it fits great. Pretty much like a unisex fit to me. It's not itchy or discomforting and good quality for what you spend. The color is a vibrant green and the transfer lettering is clear and quality as well. You can get this same t-shirt in Mens for $19. What kind of t-shirt are you looking for? This store has a huge variety to choose from. Check it out and find the perfect one that fits your fancy.